Both sexes of Bannerman's Weaver Ploceus bannermani are golden yellow below and on the crown, with green upperparts; a pale eye contrasts with the small black face mask. There are no similar species in its montane forest habitat within its restricted range. 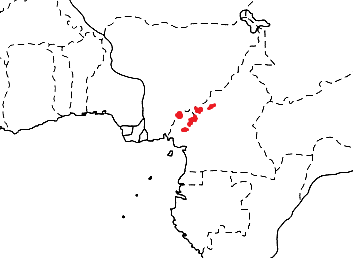 Bannerman's Weaver occurs in West Africa, in far eastern Nigeria and western Cameroon (see map below, based on Birds of Africa). No subspecies are recognised. It is listed as Vulnerable, but it occurs in several protected areas, and there is a major conservation programme at Kilum on Mt Oku in Cameroon. 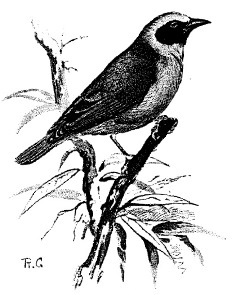 Bannerman's Weaver inhabits forest edge and dense shrubby habitat in more open sectors, including clearings, of montane forest; along strips of forest in deep ravines of Obudu Plateau, and in secondary scrub. It is absent from the wetter mountains but may be tolerant of degraded forest. The diet of Bannerman's Weaver is unknown, but presumably includes insects and fruit. It usually forages in pairs, and sometimes in small parties. Bannerman's Weaver is a solitary nester, and apparently monogamous. The nest is retort-shaped with an entrance pointing downwards and no tunnel. The outer wall is compactly woven with grass stems and thin grass leaf blades. It is sparsely lined with grass husks and soft plant down. The nest is attached to the thin branches of thorn bushes, 2-3 m above the ground. A clutch is 2 eggs and they are pale blue with evenly distributed fine brown speckles. A recent study showed that the peak breeding season was between August and October; nests were sited in reeds, vines and shrubs; and a major cause of breeding failure was egg predation by children. Bannerman's Weaver has no PHOWN records (see PHOWN summary). Submit any weaver nest records to PHOWN (PHOtos of Weaver Nests) via the Virtual Museum upload site.